Edit: Cermak's game is over, will be on Twitch for 2 weeks I guess. Was round 5. Two 4-1 on MTGO with this list, losing the last game against UB control only due a mull to 5 at g2 and 5 lands in a row in g3. That's awesome, and quite a lot of spice. Not even a single Fauna Shaman to get Leovold and Titania seems strange but there's GSZ so.. That's a new approach. Nissa working well? How was Yavimaya Hollow? @Nissa: this is the only build i would include her, probably. You need many creatures to reliably put somewhat with her 0 ability, and this is a nonbo with one of the major pros of switching Fauna for Recruiter, still hitting Recruiter with his 0 ability is awesome and the deck is made to maximize the possibility of hitting with only 3 Loyal counter (ideally, t2 Nissa would mean a t3 Nissa that starts to put creatures in play at a reasonable rate). You can also doing +2 and just making some good card quality while charging the ultimate, obv. @Hollow: A nice tech-land, Stronghold has been discarded since it requires black mana. It helps against all non-white decks (beside combo, obvs) and still against d&t it can helps to chumpblock something big. Dunno how to tweak this build. I was thinking about increasing the number of Jailer so 3-4 cutting Nissa, because Jailer is reallty awesome and very often the topdeck you want, it helps against so many things. Looks like it'll be over quick.. 1 land hand with Vial meets Pithing Needle and Wasteland. Lookslike it'll be over quick..
Ah yeah, if I see him on camera again I'll post a message about it. Cermak back on stream! Edit: ... and done. This game was vs UB Shadow. @Memories: going heavy on Jailers is another interesting approach.. Couldn't think of much useful input for you yet, maybe someone else can. Last edited by pettdan; 03-24-2019 at 01:55 PM. Had a fun tournament this weekend where I 3-0'd (6-1 in games) with a land focused version using Excavator, Azusa, Kotr, Tracker, Titania. I won 2-0 over Enchantress (very good matchup, Leovold is absurd here), 2-1 over BR Reanimator (good topdecks), and 2-0 over 4c (5c?) Loam with blue, IIRC, he didn't draw very well there (no Toxic Deluge, no t1 Mox Diamonds, always t2 Chalice when it's too late). I had the idea to make a budget version with 4 Death's Shadow. I think going Vial, Mother, Shadow would be pretty good. This is close to what I've been suggesting for Modern. Scryb Rangers let you lose however much life you want to the painlands, also Sylvan Library is pretty good with Shadow. And then a Varolz for backup combo-possibility, scavenging Shadows. And maybe 4 Sanctum Prelates to shut of control and combo. We'll see. It could be very budget and maybe good. Very curious to hear if Deragun has continued playing, any news for us (me)? And Bedell? Inkfathom? We have a new local player building the deck, he's all about the loyal retainers, I think..
Last edited by pettdan; 04-08-2019 at 07:27 AM. I have continued playing. I've dropped the 5 color Rhythm idea, it did have some pretty cool plays at times, but just didn't seem worth it in the long run. I briefly tried something with Stitcher's Supplier, Splinterfright, Varolz, etc with multiples of Griselbrand/Loyal Retainers, but quickly saw that it was in fact, not very good :-) However, I do think there's something powerful there with a high creature count deck and Supplier/Splinterfright. Splinterfright can go from a 2/2 when played to attacking for 5+ (trample) between his upkeep trigger and dropping a supplier pre-combat. 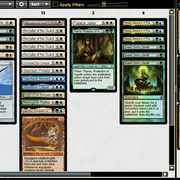 So I'm still brewing around with the idea, but I think it'll be a pretty different deck if it ends up working out. I'm close to settling on a first decklist based on this idea, but I'm not sure it would fall under the MOST umbrella (no Fauna Shaman, no vial, black heavy). Let me know if you'd like me to post it here anyway. Nice to hear you're enjoying yourself and improving, Deragun! Thanks for sharing! Yeah you can post that deck here, I think, it seems like you have a lot of creature synergies in it so we can at least learn form it and consider using it in a Fauna Shaman shell. Rhythm is a tough approach, it can probably do wonders, like having infinite Glen Elendras and Kitchen Finks is pretty good, etc etc. But adding the fifth color and reducing the amount of creatures in favor of enchantments that don't necessarily help with the toughest matchups will be a challenge to pull off. It still has potential, I think, but it's hard to realize. I think MD Prelates is the way to go, so much upside in so many matchups..
How has Griselbrand been for you then, in what matchups does he shine? Since we can't draw into FoW's, depending on build of course, it's not clear how much he's needed. Draw 7 is pretty good vs control decks and flying 7/7 lifelink is pretty good vs lightning bolts and delvers, so maybe it's the way to go. To some extent Stoneforge Mystic + Batterskull can do similar things but much more reliably, it's hard to figure out which way to go.. I didn't play much Griselbrand or Retainers yet, I have used Retainers with Elesh Norn, as I recall, to shut down any creature based matchups. Like a super Orzhov Pontiff. How has Griselbrand been for you then, in what matchups does he shine? Since we can't draw into FoW's, depending on build of course, it's not clear how much he's needed. Draw 7 is pretty good vs control decks and flying 7/7 lifelink is pretty good vs lightning bolts and delvers, so maybe it's the way to go. To some extent Stoneforge Mystic + Batterskull can do similar things but much more reliably, it's hard to figure out which way to go.. Otherwise, in my view it would ideally be a hard-castable similar threat without the draw 7 rather than a quad-black card you're never casting, and still be just as good in most cases. I've thought about trying Atraxa as the target instead of Griselbrand, but I've had too much trouble keeping Atraxa around consistently. Between Dismember,Delver+other blocker/removal, Pteramander, etc, she usually isn't too long for this world for me. My latest thought is that possibly Lyra Dawnbringer might be the best middle ground here. She's castable, and 5/5 first strike deals with most of the trouble I've seen with Atraxa. I might try that out and look to include most of the really good legendary creatures (Merieke, Leovold, Lyra, Teeg, etc) and have the Loyal Retainers be a bit more toolbox-y rather than solely coupled with a non-castable fatty. Elesh Norn is also an interesting idea, but I tend to go down in life often enough that it's the lifelink that saves the day the most. And if none of this works out, I may try the stoneforge/Batterskull idea as well. I was originally thinking of this as Abzan with Moms and Vials, but I think this feels like a smoother deck in comparison. There's a shocking amount of card advantage and deck manipulation between Suppliers, Bobs, Strixes, Flayers, Splinterfrights, Guile, and being able to rebuy most of those with Liliana which I hope will make up for having to play into counterspells without Vial. Basic idea is to T1 supplier to get the flayer/splinterfright engine going, or to play a Hierarch as removal bait so real threats stick later. Then start slowing things down a bit with Strix/removal and drop a Bob to get ahead and late game search up a giant splinterfright to finish. And there's enough safety valves between Therapy flashback, Liliana, and push/decay to manage life totals with Bob when needed, but low CMC in general as well as library manipulation going on that I hope to not take too much off of Bob most of the time. As I'm still thinking through this even for the MD, I don't have much of a sideboard yet...but I assume it'll start with a few flusterstorms and a suite of thoughtsieze for combo match ups. I also really like the idea of an Edric, Spymaster of Trest for grindier matchups to get more cards off of Strix and tramplers. I would love anyone's thoughts on this, and I'll update once I get the Confidants and start trying this out at my local. Actually I'd suggest Sword of Light and Shadow before Batterskull, but they are both useful. The Sword just seems to have a lttle more utility. Regarding your list, two things come to mind. First, there's too little synergy to motivate Stitcher's Supplier, I feel like. Not sure what you should add, could be some value card like Deep Analysis or aggro card like Bloodghast or Vengevine. Not sure I like any of them enough.. Probably try a mix and get a feeling for them. The other issue is interacting with Storm and Sneak and Show, it's like a Legacy fair deck lackmus test. The therapies are a good start but you need something more, probably some Thoughtseizes since they make follow up Therapies very good. Typically you would like to couple that with hatebears or counterspells or a very fast clock (like Arclight Phoenix or Marit Lage). [edit: just noticed the Leovold, great] That's not so easy to put together.. Liliana of the Veil is another option. So, just some things to consider as you start testing..
Also 16 lands looks a bit light, but you have gsz into arbor and nobles and a lot of card draw so it might work. ^Same thought: you have many enablers for what? Supplier is laughable in Legacy if you don't have something really strong to enable. I first suggested we only use it for narrow discussion among the active players, in case someone doesn't want to share some tech for whatever reason (I sometimes noticed this). I thought this would encourage more open sharing of information on the Source where everyone can find it more easily.. Now there is a channel available for the active contributors only, in case someone wants to keep some discussion confined. So, use your nick name from the Source for access to that channel! Last edited by pettdan; 04-15-2019 at 02:21 PM.